It has been a really fun weekend and it isn't over yet. On Friday I loaded up my posse (Isabel, Adrienne, Kate, Jean and my Mom) and we headed over to Kathleen's sale in Mt. Angel. I didn't get any pictures, but you can see some of her adorable things on her blog. We then headed down the road a little further to attend Joy's Holiday Open House. This is the third year that I've gone to her Open House and it gets lovelier every year. Joy's eye for detail is just remarkable. I was too busy looking at all of her cutie decorations that I didn't get any pictures, but Isabel and Adrienne took lots, so I know they will be posting about it soon. You can check out some pictures of Joy's Open House a few years ago here. 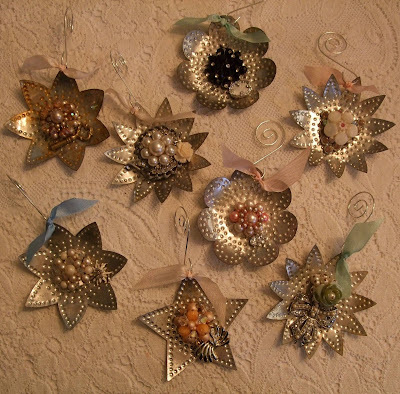 As mentioned before, here are the little Christmas ornaments I made and took to Monticello. I think they turned out pretty cute. I've had these tin reflectors for a while and just decided to add a little jewelry to them. Simple and sweet. Today we will be going to cut down our Christmas tree and the decorations will be coming out. I have a fun cookie exchange party that I will be going to as well, so I better get baking. Have a lovely Sunday! those are really cute Lisa!!! Lisa...how did I not see these? I love them! I want to buy one for my tree! Do you have an Etsy? Have a great Sunday! I love your ornaments. Hope you had fun Christmas Tree hunting and stayed warm. Can't wait to see pictures of Joy's Open House. I have only been to one of her Open Houses with my buddy Florence last Fall and it was fabulous. How did I miss this one?? Those are such cute ornaments....wish I could make my way down to Monticello this December...boo hoo to me! Thank you again for all your help! I so appreciate you! I also loved your cookies! Let me know when I can come your direction for whatever I can do to help you! I just had to let you know that your ornaments are so sweet! I would love to have one for our tree. Are you selling them? I love your sweet ornaments. Are you taking orders? Very creative--they would look just perfect on our tree. I love your idea! Somehow I ended up with a bigger tree thias yeasr asnd it needas more bling. Are you selling them on Etsy or elsewhere? Oh, I wanted to get over to Mt Angel this past weekend too...but didn't make it! Hope you had a lovely time. oh! they turned out great! These are very sweet. I just cleaned out the studio last weekend and found a box of brooches I made with reflectors and trim and orphan earrings. They are so festive! Maybe I'll put them up on Etsy and see how they do. Hope you are well and staying warm. I'll be at Crafty Wonderland late in the afternoon on Sunday...are you going? Very Cute! Love those. Another fantastic creation by you. Looks like I missed a really fun day. DARN IT! a hand made creation.It is a great piece of collection and lovely. Love the reflector tree ornaments! They are so pretty! I love your idea! I have some little tart tins that I've wanted to turn into ornaments. I think a little sparkle in the center will be just the ticket!